Some people may drink their coffee black and eat their cereal dry. But for the rest of us, a life without milk is a sad life indeed. That being said, not everyone may choose to drink cow's milk. Maybe you have a milk allergy or are lactose intolerant; perhaps you ascribe to the belief that human milk is for humans, and cow's milk is for cows. Or maybe you think that plant-based milks are "healthier" -- whatever that means for you -- than cow's milk. If you fall into this segment of the population, you know the list of alternatives can be daunting. Just take a trip down your natural foods grocery aisle and you'll see grain milks, seed milks and nut milks galore. Story continues below the infographic. While they appear in the same aisle, not all alternative milks are the same. Almond milk and oat milk, for instance, contain healthy monounsaturated fats (oat milk also contains some fiber), while coconut milk is higher in saturated fat. Cashew milk has iron, and sunflower seed milk has vitamin E, says registered dietitian nutritionist Sarah Krieger, a spokesperson for the Academy of Nutrition and Dietetics. 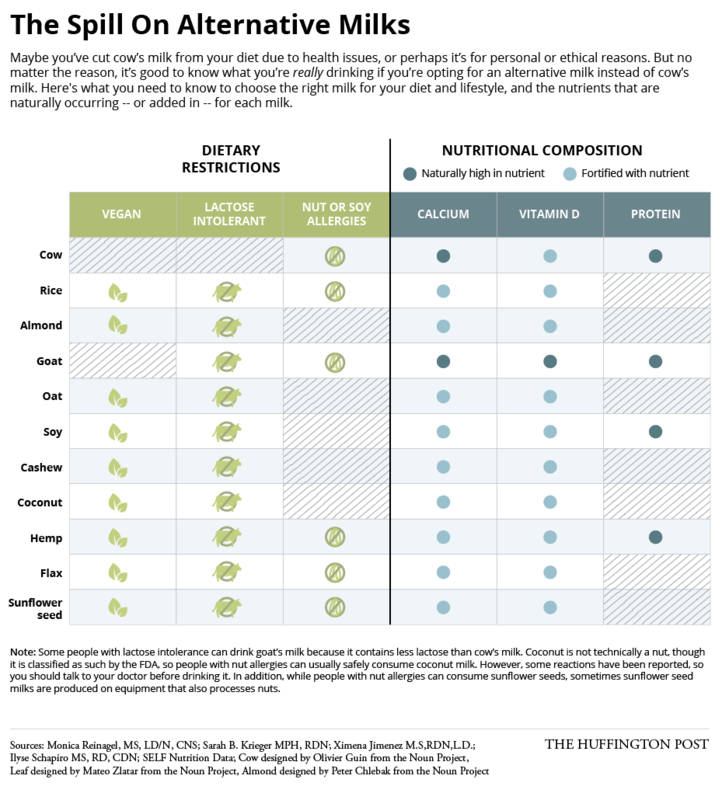 It's also important to keep in mind that just because a plant-based milk has the word "milk" in its name, does not mean it's nutritionally equal to cow's milk -- the amount of protein in a cup of nut milk is much lower (about 1 gram) compared with cow's milk (which has about 8 grams), for instance. Whatever your reason for drinking alternative milks, just keep in mind that some of the products contain added sugar, says Ilyse Schapiro, MS, RD, CDN, a registered dietitian with a private practice in New York and Greenwich, Connecticut. "If you're going to buy an alternative milk, I would look at the sugar content and always buy the unsweetened variety," Schapiro explains to HuffPost. Some of the store-bought plant-based milks also contain a food additive called carrageenan, which is a thickener and emulsifier that has been shown in some animal studies to be linked with health problems gastrointestinal inflammation, Schapiro said. (The maker of Silk and Horizon alternative milk beverages recently announced it was removing carrageenan from its products.) However, studies of the additive in humans have been inconclusive. Many alternative milks have vitamin D and calcium added to them because the nutrients are not naturally occurring, Krieger says. (In fact, even cow's milk has extra vitamin D added in, too.) While there's nothing harmful about this fortification, too much fortification may be unnecessary: "More is certainly not better when it comes to vitamins and minerals," Krieger tells HuffPost, adding that our bodies excrete what they don't need. While most excess vitamin additives in our food are excreted via our urine, they can also cause diarrhea in some cases. To avoid unwanted additives in store-bought alternative milks, Schapiro recommends making your own (there are a wealth of recipes on the Internet, and most involve blending the "source" of the milk -- say, cashews, or almonds -- with water).